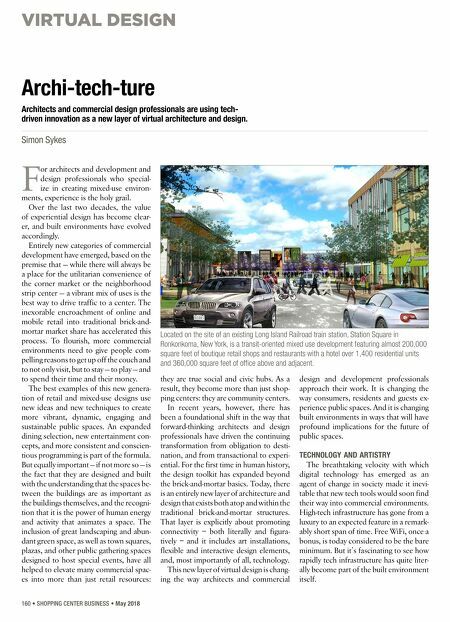 VIRTUAL DESIGN 160 • SHOPPING CENTER BUSINESS • May 2018 F or architects and development and design professionals who special- ize in creating mixed-use environ- ments, experience is the holy grail. Over the last two decades, the value of experiential design has become clear- er, and built environments have evolved accordingly. 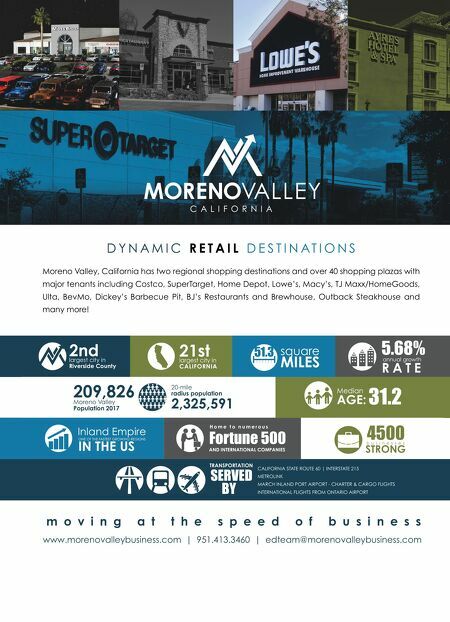 Entirely new categories of commercial development have emerged, based on the premise that — while there will always be a place for the utilitarian convenience of the corner market or the neighborhood strip center — a vibrant mix of uses is the best way to drive traffic to a center. The inexorable encroachment of online and mobile retail into traditional brick-and- mortar market share has accelerated this process. To flourish, more commercial environments need to give people com- pelling reasons to get up off the couch and to not only visit, but to stay — to play — and to spend their time and their money. The best examples of this new genera- tion of retail and mixed-use designs use new ideas and new techniques to create more vibrant, dynamic, engaging and sustainable public spaces. An expanded dining selection, new entertainment con- cepts, and more consistent and conscien- tious programming is part of the formula. But equally important — if not more so — is the fact that they are designed and built with the understanding that the spaces be- tween the buildings are as important as the buildings themselves, and the recogni- tion that it is the power of human energy and activity that animates a space. The inclusion of great landscaping and abun- dant green space, as well as town squares, plazas, and other public gathering spaces designed to host special events, have all helped to elevate many commercial spac- es into more than just retail resources: they are true social and civic hubs. As a result, they become more than just shop- ping centers: they are community centers. In recent years, however, there has been a foundational shift in the way that forward-thinking architects and design professionals have driven the continuing transformation from obligation to desti- nation, and from transactional to experi- ential. For the first time in human history, the design toolkit has expanded beyond the brick-and-mortar basics. Today, there is an entirely new layer of architecture and design that exists both atop and within the traditional brick-and-mortar structures. That layer is explicitly about promoting connectivity – both literally and figura- tively – and it includes art installations, flexible and interactive design elements, and, most importantly of all, technology. This new layer of virtual design is chang- ing the way architects and commercial design and development professionals approach their work. It is changing the way consumers, residents and guests ex- perience public spaces. And it is changing built environments in ways that will have profound implications for the future of public spaces. TECHNOLOGY AND ARTISTRY The breathtaking velocity with which digital technology has emerged as an agent of change in society made it inevi- table that new tech tools would soon find their way into commercial environments. High-tech infrastructure has gone from a luxury to an expected feature in a remark- ably short span of time. Free WiFi, once a bonus, is today considered to be the bare minimum. But it's fascinating to see how rapidly tech infrastructure has quite liter- ally become part of the built environment itself. Archi-tech-ture Architects and commercial design professionals are using tech- driven innovation as a new layer of virtual architecture and design. Simon Sykes Located on the site of an existing Long Island Railroad train station, Station Square in Ronkonkoma, New York, is a transit-oriented mixed use development featuring almost 200,000 square feet of boutique retail shops and restaurants with a hotel over 1,400 residential units and 360,000 square feet of office above and adjacent.